Saturday is one of significant importance for those in the United Kingdom and the world for that matter. It's both the FA Cup soccer final, as important to people in the UK as the Super Bowl is to Americans, and Prince Harry and Meghan Markle's royal wedding. Celebrating all the excitement on Saturday morning will be the patrons of the Blue Anchor Pub in Delray Beach. Parts of the interior and exterior of the pub were actually in London during Jack the Ripper days and were brought to Delray in the '90s. The owners say the establishment is haunted by a ghost that was killed in the bar before it was moved to America. So now with an international ghost, the festivities on Saturday morning will be quite large. "We will be opening at 6 a.m. Spirits will be flowing as well as coffee and hot breakfast," says pub owner Peggy Snyder. The owners expect everyone to dress in their best for the wedding; it's a wedding after-all. They have Prince Harry and Meghan cutout so you can get festival Royal Wedding photos. 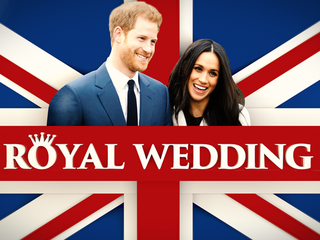 "It kinda’ takes you over the big pond where you're here in America, but you feel like you're in London actually seeing the wedding," says bartender Trent Bullard. But if you want to get into the event, it's sold out as I started writing this piece. After the Royal Wedding you don't need a reservation to watch the soccer, I mean football game, but there is a scheduling conflict of ROYAL proportions. Prince William, who is serving as best man for his brother, is president of the Football Association and is expected to attend the match. "It's a long-standing English tradition that the President of the FA Cup is on hand to enjoy the game and reward the champions their trophy for winning the cup," says Snyder. The palace has announced the Prince would not be attending. The Blue Anchor Pub will have several specials, and festive shirts on hand to celebrate. WPTV's wedding coverage begins at 4:30 on Saturday morning right here on WPTV NewsChannel 5.